I had a history of choosing the same Halloween costume year after year when I was a kid. I was a princess, then a queen, Cinderella… well, you get the idea. Royalty was kind of my thing. 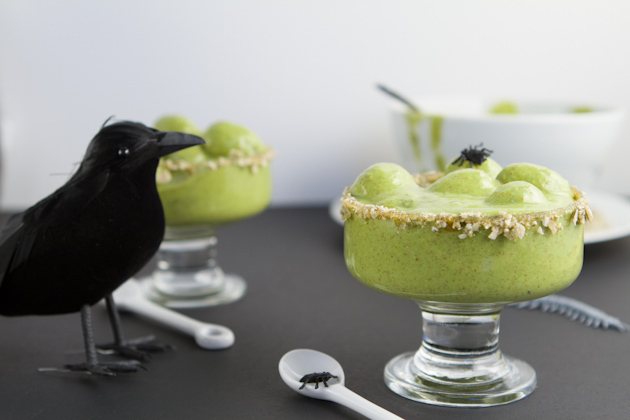 While I never enjoyed being any of those scary things, I did enjoy eating spooky Halloween food. 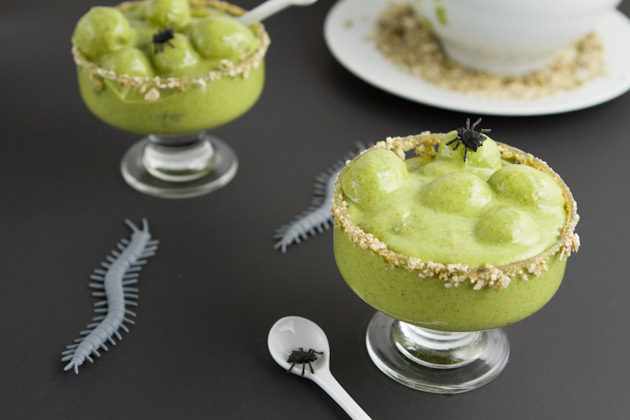 Out of all the Halloween recipes I’ve helped my Mom make, enjoyed at school parties and made for my friends, this recipe for witches brew is, by far, the funnest to eat. It totally looks like bubbles, doesn’t it? Ha! Too fun. I’ve been enjoying breakfast pudding every morning since I shared the recipe back in June. Heck, I even made a huge batch and took it camping with us this past summer! This pudding will keep your insides smiling (rrr witch crackling in this case). And really, with a breakfast like this in front of you, you’ll be smiling ear to ear, too! To email, text or print this recipe, click here. 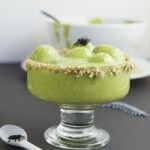 Digestion stimulating breakfast that will make any witch happy! Ground flax seeds, then pepita seeds. 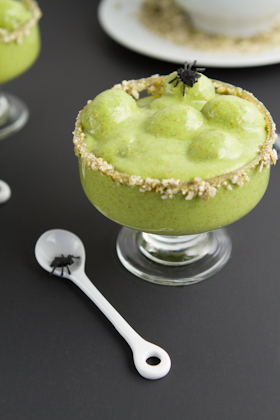 Set ground pepita seeds aside on a plate. Prepare serving dishes by dabbing a knife in some coconut nectar and running it along the edge of a bowl and flipping it over into the ground pepita seed mixture to create a rimmed bowl effect. Set aside. 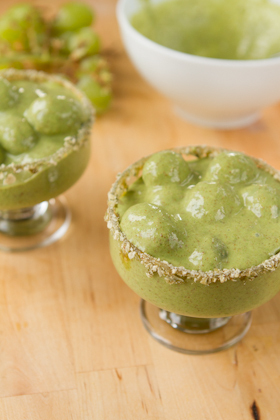 Add remaining ingredients except grapes to a blender and blend until smooth. 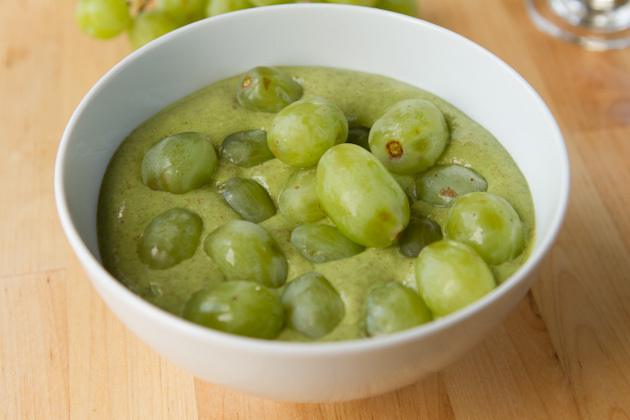 Stir in grapes. Do not blend grapes. Drop into prepared dishes and serve. You can use pre-ground flax seed for this recipe, it just wont yield the same health benefits as fresh ground flax seed (the nutrients deplete over time so it’s best to ground your flax seed yourself. I use a $20 coffee grinder to grain small amounts of nuts, seeds, grains and spices. 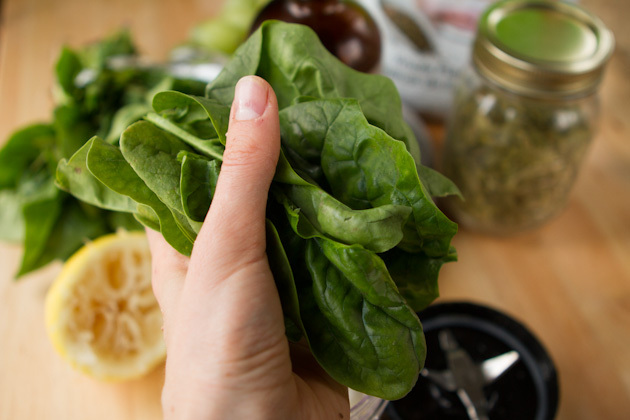 Such a great tool to have in a healthy kitchen! Flax oil is another sensitive recipe, but well worth taking care of. Make sure that you purchase an oil that’s been refrigerated and in a dark bottle. Store in the fridge at all times! 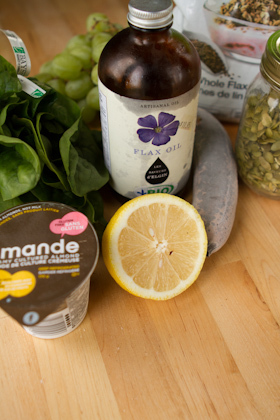 Add these ingredients, along with a handful of spinach, yogurt, lemon juice and banana to your blender. Rim your bowls with whatever you have handy. Honey, agave, whatever. It doesn’t have to be perfect either, in fact the more messy it is the better. You’re making a caldron! And portion out into your prepared cups.